There are so many aspects about new parenthood which people tell you about; you heed advice from all corners of the world. However, there's one piece about having a baby which, I'm assuming to save you from the anticipation, people just don't talk about enough: how having a baby will change your relationship with your partner. Having a baby is world-changing, period. It's all consuming. It's like a tornado lands on your heart and sometimes you can hardly breathe. There are moments of total joy and bliss, and moments of amazing fear and worry. Moments of complete and utter frustration, and moments of peace and gratefulness. It's a rocky journey, especially those dreaded three months. It hasn't been the easiest year, or so. Between all the fears of pregnancy, the diabetes, a new baby, my emotions, long nights...it's been tough, as it is for most new parents. But, he's been my constant source of strength. His belief in my decision making, mothering, and big life decisions, have been my rock and helped me feel a little less insane on during those totally not sane days. Eric amazes me on a daily basis. His knowledge of music, let alone his ability to sit down and compose gorgeous, soul-shaking songs, his love for his, and my, family, his optimism. In the last five years, he has grown up, before my eyes, and I am so proud of the man he is. But, what amazes me most of all about Eric is how he has dealt with all of these changes and growth. Relationships ebb and flow; there are times of utter bliss, and times of utter annoyance. Throwing a new baby into the mix makes all the highs higher, and all the lows lower. In those first few months, sometimes you worry that your rock-solid team is falling apart, because you feel like you're falling apart. On top of all that, bringing a new baby into your life brings amazing amounts of growth and maturing. It has been such a joy watching Eric morph from someone who rarely held a baby into a confident, funny, wise father. Marriage is the incubator of love, the protected environment in which a love that is personal and touching and real can grow and, as a consequence of that growth, develop in us our highest capabilities as loving human beings. We are each still and always growing, and when we marry, we promise not only our own growth, but also our willingness to witness and withstand the ongoing growth of another human being. That is because in marrying we promise to love not only as we feel right now, but also as we intend to feel. And, that's exactly how I still feel. Being married to Eric, with his strength and love behind me all the time, has allowed me to grow as a woman, as a mother, and find my voice as a writer, which is something I've always wanted to do. He has given me a safe place to explore my dreams and take risks. I hope I'm always his safe place, too. 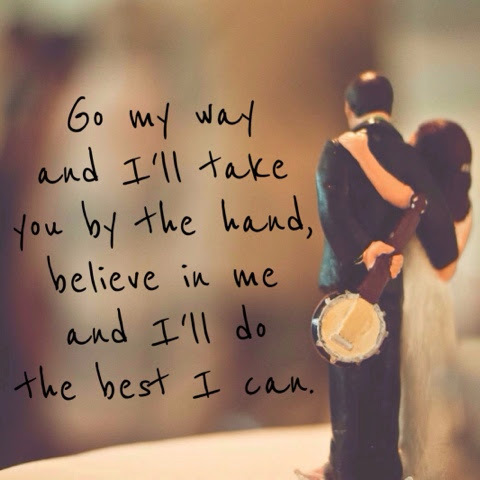 The lyric on the photo (which is from our wedding; it's the cake topper my step-father made for us! ), is from a Gordon Lightfoot song, Go My Way, which was the first song Eric put on the first mix CD he ever made me. I knew, when I listened to that song, that he was signing on to be my co-captain for life, and I still feel so grateful every day that I get to navigate the sunny and stormy seas of life with him.